Are you looking for a large family home in one of the most desirable communities in Land O Lakes??? Look no further! 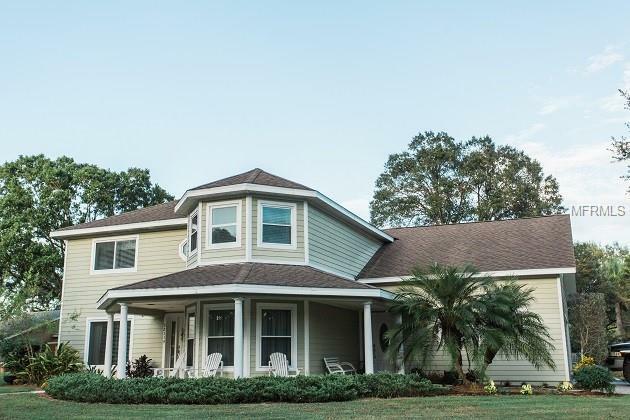 This well-built home is located in Lake Padgett Estates, a waterfront and equestrian community. The home features 5 bedroom 3.5 bath home, a loft area and bonus room. Built in 2005, the home has Foam Wonderwall with an insulation value of R30 and engineered to withstand 300 mph wind. There is also energy efficient insulation and double pane double hung windows. The home has an open floor plan with a formal dining room, living room, den with fireplace and surround sound, loft and breakfast nook. Some of the many features also include: new plank wood flooring, granite counter tops, solid wood cabinets, stainless steel appliances, center island and wrap around bar that seats 8, wired for security system, and speakers on outdoor porches. There is a 300 ft. well replaced and water softener re-bedded in 2017. The A/C units replaced in 2016. In the over half acre backyard there is a fishing dock and pond, fire pit, shed, and playground. Also, a large screened in pool with plenty of room for entertaining. Lake Padgett Estates is just off hwy 41, centrally located between Suncoast Parkway and I75. The community has access to 3 ski lakes with boat ramps, 1 non motorized lake, 5 parks, horse stables, and tennis courts - all that and there is no CDD or HOA fees. Additional Lease Restrictions Buyer To Confirm Restrictions. Pet Restrictions Buyer To Confirm Restrictions.